LG V20 PH Pre Order Promo Announced, Comes With A FREE 200 GB Micro SD Card For PHP 35990 Only! Home / lg / mobile / news / LG V20 PH Pre Order Promo Announced, Comes With A FREE 200 GB Micro SD Card For PHP 35990 Only! LG's V20 ranks among the most promising and intriguing flagship smartphone today. Why? It's the first handset in the world to load with the new sweet Android 7.0 Nougat OS and the high-end HiFi goodness of a Quad DAC audio for audiophiles. 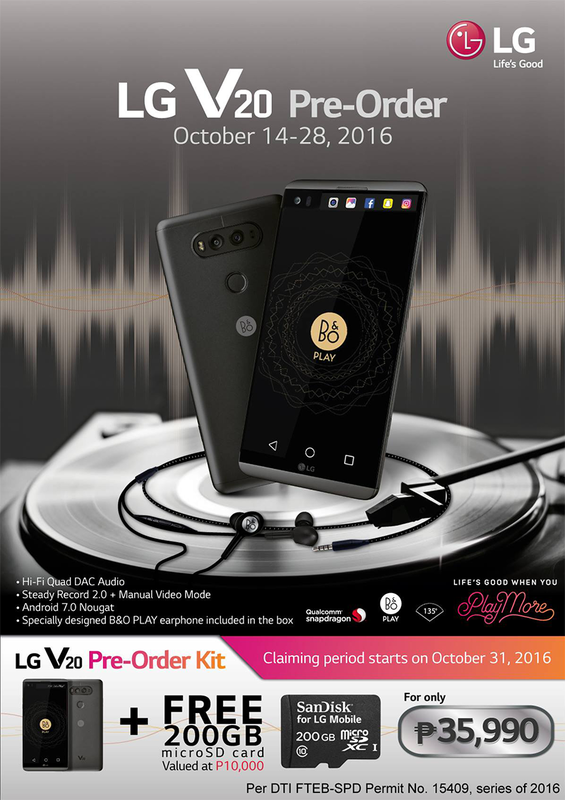 LG V20 pre-order in the Philippines! The LG V20 also loads with all the modern goodness that should be on a high-end smartphone. There's a slim and solid full metal frame, QHD resolution, 64 Bit Snapdragon 820 processor, 4 GB RAM, 64 GB expandable via micro SD card slot up to 2 TB, 3,200 mAh w/ Quick Charge 3.0, 16 MP f/1.8 w/ Hybrid AF, OIS and 8 MP f/2.4 135 degrees wide angle lens w/ dual tone LED flash, 5 MP f/1.9 w/ up to 120 degrees wide angle, fingerprint scanner, and LTE connectivity. The good news is, LG Philippines has announce that this handset is now available on pre-order starting today October 14 to October 28, 2016 for PHP 35,990 only! On top of that, it'll come with a FREE 200 GB micro SD card and B&O in ear monitors inside the box. For the full mechanics of this promo and the list of participating stores, make sure to visit http://www.lg.com/ph/promotions/LGV20Preorder now.